Tales From A Geordie Goth : Dressing Table Makeover. Part Two Drawers. When I bought the dressing table one of the handles was missing from the drawers, and I broke another handle while removing it, which was a shame as I love the handles. I did the same process as the dresser, I sanded the drawers and painted the drawers with Wilko's primer and placed two coats on the drawers. 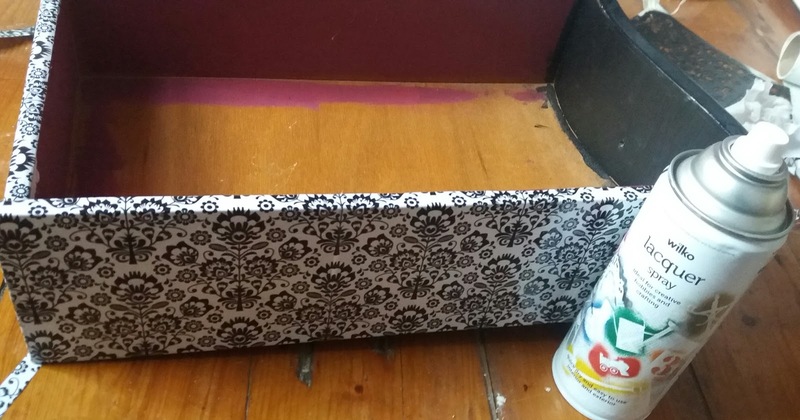 I ran out of Rustoleum paint and purchased a cheaper paint to finish the drawers. Big mistake. The colour was fine but the was appalling and highlighted every lump and bump. In comparison, the Rustoleum paint seems to dry smoothly. 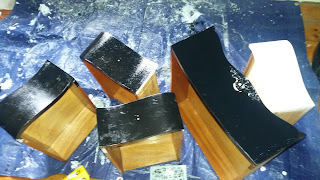 I purchased more Rust-Oleum Gloss Furniture Paint Liquorice black, fortunately, it was a special offer for two for £24 for two tins, so very happy. I'm unsure about what to do with the drawers interior. 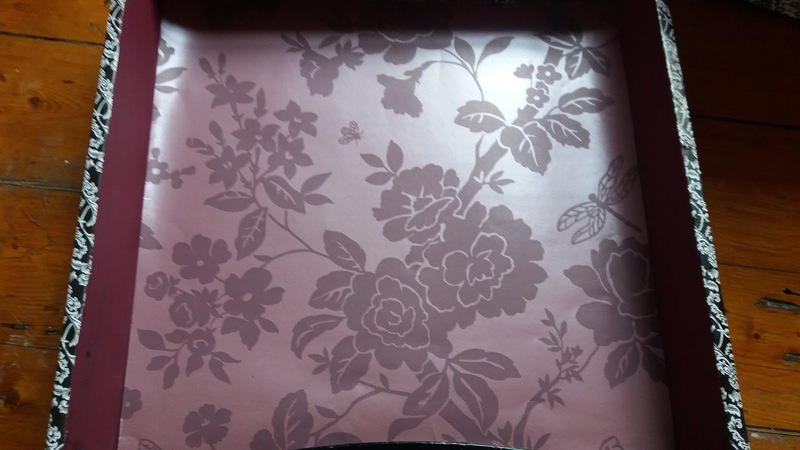 After finding some of the previous Owner's leftover paint I found a gorgeous a burgundy, fuchsia, with a great name of Dark Elegance. I opted to paint the drawers, I sanded the drawers, painted with Wilko primer and give it four coats of paint. 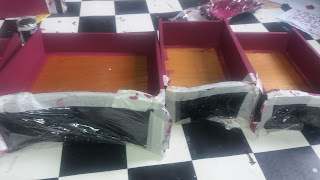 To protect the drawer fronts I wrapped them in cling film and secured with masking tape. Originally, I painted the drawers with the emulsion paint after painting it the drawers kept getting dirty with dust and the paint kept coming off . I started to dislike the colour. 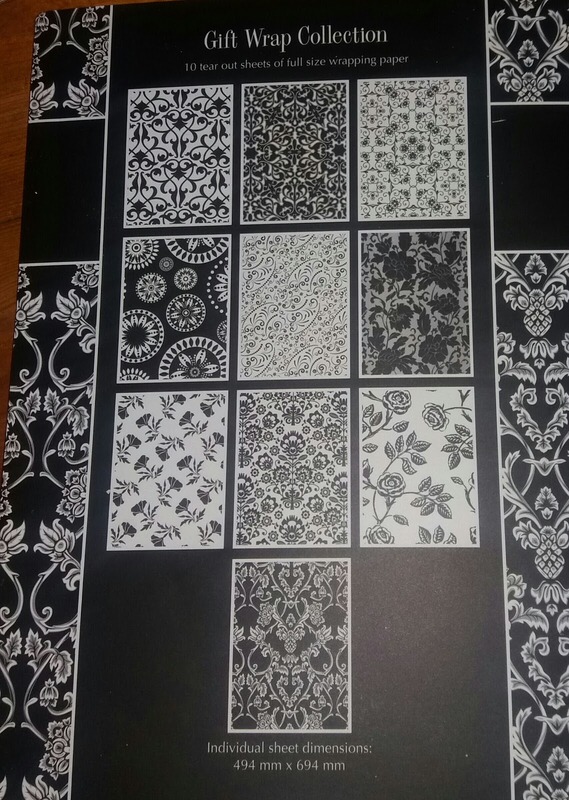 I covered them with black and white pattern wrapping paper I purchased. I sprayed lacquer to protect the paper. For the interior of the drawer, I used wallpaper to line the drawers. 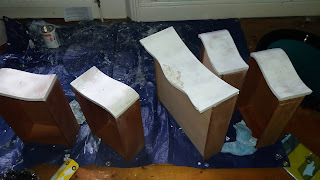 I trace the wallpaper to the shape of the drawers and cut them out to place in the drawers. At the beginning of the year, I was inspired by Bane's stencil work for GIY, and I've wanted to to do some stencilling. I decided to try on the drawers to create some interest on the dresser. 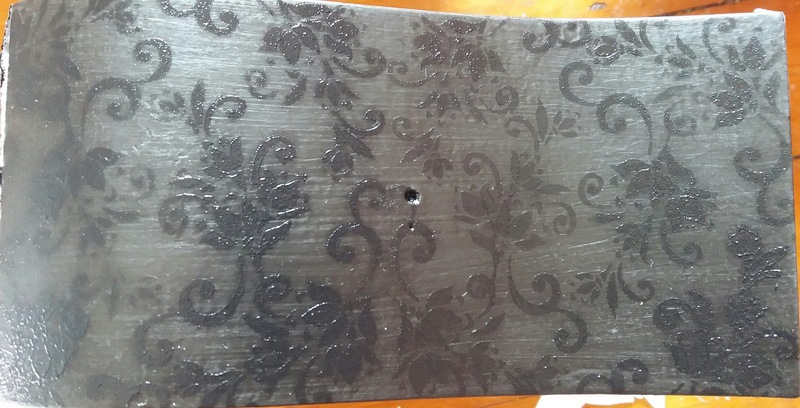 Before attempting the stencil work, I practised beforehand using a roller on it seemed to work brilliantly, once I trialled out on the drawer fronts the stencilling looked crap. I sanded the drawers and repainted them. I found this tutorial on youtube, which was extremely helpful. 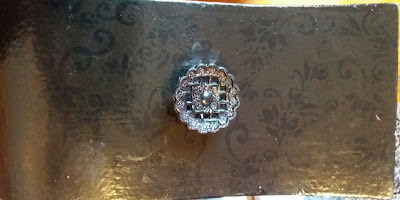 On my second attempt, I opted for a stencil brush and dabble the paint onto the drawer fronts. The second attempt was perfect, the stencil pattern came out clear with all the intricate patterns visible. I used a mixture of acrylic paint and Rustoleum paint, I slowly dabbed the paint onto the surface building the pattern up. 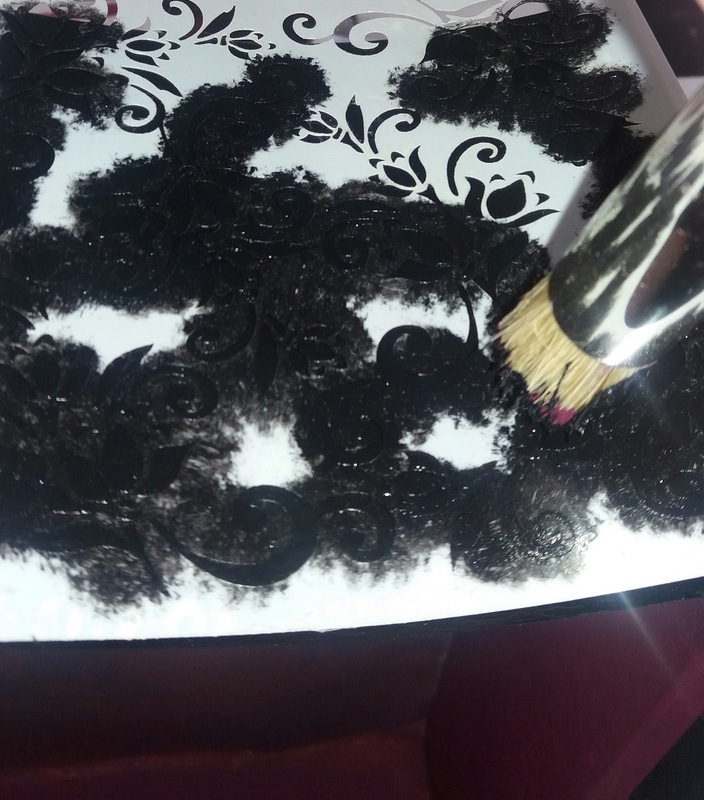 I really can't recommend the tutorial enough for stencil novices such as myself. The stencil was from local department store' s craft section. Then stencil is by Imagination Craft called Lacy Swirl. It cost £4. I sprayed with lacquer to give it a glossy finish and protect the paint. I love your black make-overs, and this one is so very pretty! Thanks me, I'm so addicted to tranforming via the colour black. I'm wondering wheather to find a new colour. Thanks, I'm surprised at how they've turned out. It is a shame about the handles.